Summer vacation has come to an end in Arbenville. Soon friends Henry, Maggie, and Russell will return to their prospective colleges as seniors. Currently, Henry is working as caretaker for the historical Humboldt House, a job as exciting as watching grass grow. When Maggie, now into archaeology, enlists his aid in an amateur dig, his reluctance is only half-hearted. Maggie wants to hone her budding skills by excavating the outhouse of the Prewitt mansion, a deserted home on the outskirts of town. Since they don’t have a permit, this has to be done at night. With Russell in tow, the three find nothing of value, until Maggie digs up an ornamental apothecary bottle. “She held up the lantern to illuminate the object in her hand, a pint bottle of the most beautifully clear aquamarine glass with a cork in the top. The next discovery is much more exciting, and definitely more chilling. “I brushed like mad, and what I swept into existence was a small hand, all five fingers intact and attached to a thin arm bone that disappeared into the night soil. ‘It’s a baby,’ I whispered. With the aid of a mysterious phone call, Henry goes through the Humboldt archives. In an old photo album, he finds a picture of Marlby Prewitt, wife of the mansion’s original owner. In the grass at her feet lies one of Dr. Anchill’s bottles. There have been murders every 30 years since. When Russell’s employer and his wife are killed, and the girl Henry is halfway courting is found dead, the three realize the Twilight Pariah is back. It wants the bones of the child found in the outhouse dirt, and it’s killing the loved ones of those trying to stop it. They can’t go to the police. Who’d believe them? The only one who might help is Marlby Prewitt but she’d be over a hundred years old, if she’s still alive. This novella packs a great deal of story into a very small space. It’s a one-sitting book, not simply because of its lack of length but because once that first page is turned, the reader will have no wish to put it down until the last one is reached. While the story is told in a step-by-step fashion with Henry as narrator, it’s never boring. The characters are likeable, and the dialogue is crisp and snappy, that of post-adolescents employing sarcasm and profanity to keep from showing how they really care about each other. Little glints of affection still manage to shine through, however, as in how Russell tends Luther after his attack, and Henry’s concern for his father’s nighttime strolls and his reaction to his would-be girlfriend’s death. The terror buildup is of the insidious kind, but author Ford doesn’t wait to let us know we’re in for a horror tale. He jumps right in on the third page with Henry’s first sight of the manor. By the time the discovery of the child’s bones is made, the reader knows he’s in for a thrill ride, gaining momentum as the three begin their search for information, and reaching a crescendo, but nowhere near a climax when they enter the deserted Prewitt mansion. This is a definite keeper, to be reread at proper intervals. 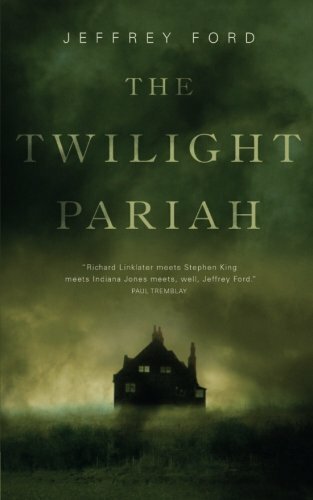 The Twilight Pariah is the kind of story that makes the goosebumps rise. Whether or not Henry and friends ever resurface in another Ford novel, their appearance in this one will have the reader eagerly searching for more stories penned by Jeffrey Ford.